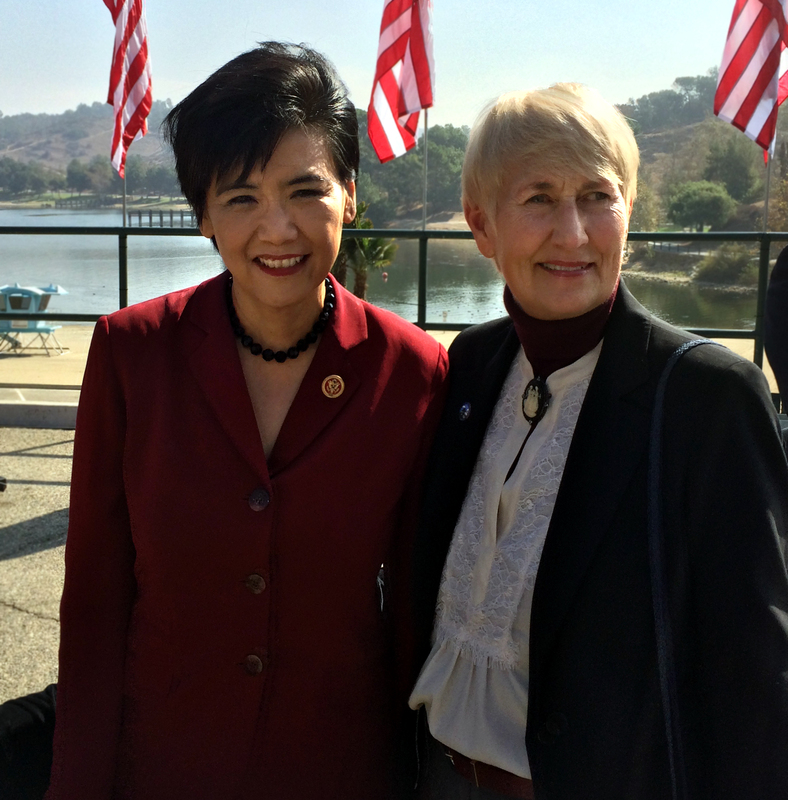 U.S. Rep. Judy Chu, D-Pasadena, left, and Santa Clarita Mayor Laurene Weste at the signing event Oct. 10, 2014, for the San Gabriel Mountains National Monument, which preempted Chu's legislative effort to create the San Gabriel National Recreation Area. Click to enlarge. House Resolution 4858 seeks to establish the San Gabriel National Recreation Area as a unit of the National Park System in the State of California. City Council support House Resolution 4858 and transmit position statements to Representative Judy Chu, Santa Clarita’s federal legislative delegation, appropriate congressional committees, President Barack Obama, and the League of California Cities. City Council support House Resolution 4858 and transmit position statements to Representative Judy Chu, Santa Clarita's federal legislative delegation, appropriate congressional committees, President Barack Obama, and the League of California Cities. On June 12, 2014, Representative Judy Chu (D-CA-27) introduced House Resolution 4858 (HR 4858), which establishes the San Gabriel National Recreation Area (NRA) as a unit of the National Park Service in the State of California. If enacted, HR 4858 would authorize 615,245 acres in the San Gabriel Mountains, primarily consisting of lands currently within the Angeles National Forest, as the San Gabriel National Recreation Area. All United States Forest Service lands within the NRA would continue to be managed through the Department of Agriculture, with the Department of Interior being responsible for those lands outside of the Forest Service area that are within the new national recreation area. The new unit is envisioned as a space in which the National Park Service can form enhanced partnerships with the United States Forest Service and various state, county, and local agencies to increase funding opportunities for additional staff, recreational programs, conservation efforts, educational opportunities, and trail access in the area. A key purpose of the proposed legislation is "to conserve, protect, and enhance for benefit and enjoyment of present and future generations the ecological, scenic, wildlife, recreational, cultural, historical, natural, educational, and scientific resources of the recreation area." Within three years after enactment, the bill specifies that a management plan for the area shall be developed consistent with the above identified goals. The San Gabriel Mountains comprise more than 70 percent of the open space in Los Angeles County and receive more than three million visitors each year. Currently, there are 29 national recreation areas in the United States. The NRA is a designation that was originally provided to lands around reservoirs with water-based recreation, but has changed over time to include other outdoor areas, particularly those in or near urban centers. The proposal to establish 615,245 acres as the San Gabriel National Recreation Area is the culmination of more than ten years of research and input from stakeholders. 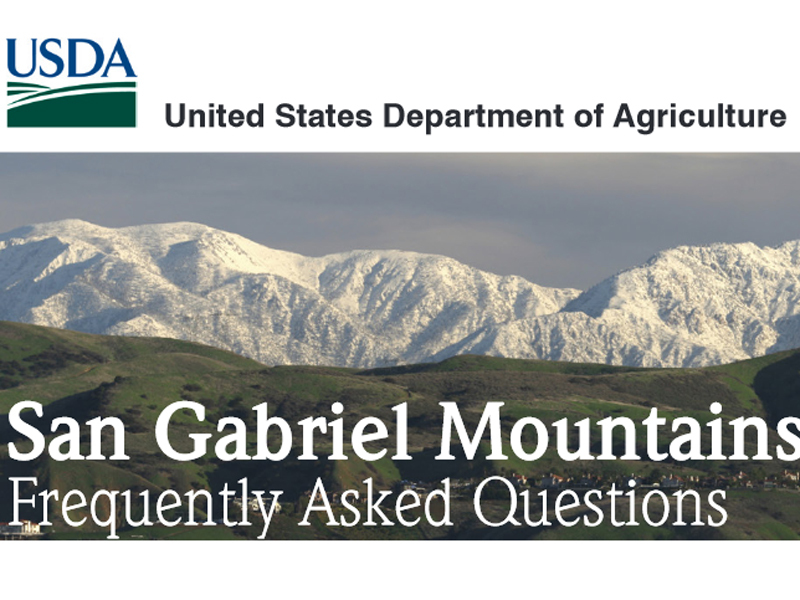 Beginning in 2004 and completed in 2013, the National Park Service conducted the “San Gabriel Watershed and Mountains Special Resource Study” to assess the feasibility of creating an NRA in the San Gabriel Mountains. The study determined that the San Gabriel Mountains possess nationally significant ecological and cultural resources, are suitable to be included within the national park system, and would be feasible due to the opportunities for collaborative management with various state and local agencies in the area. HR 4858 is the implementation vehicle for key findings of the San Gabriel Watershed and Mountains Special Resource Study. Specific to Santa Clarita, the San Gabriel Watershed and Mountains Special Resource Study recognizes the importance of the Upper Santa Clara River area. This information is critical to the City of Santa Clarita, as the proposed 56-million ton CEMEX sand and gravel mine is located within the Upper Santa Clara river area referenced in the study. The study highlights the Santa Clara River as "the last unchannelized riparian and wildlife corridor in the region, providing primary remaining east-west biological connection between the San Gabriel Mountains and the Pacific Ocean." The study further notes that "the Santa Clara River functions as an important corridor between the mountains and the ocean. Protecting this corridor is a high priority for local and state agencies as well as conservation groups." The proposed mining area and the surface estate owned by the City of Santa Clarita are not within the boundaries of the proposed national recreation area. However, the property is adjacent to the proposed NRA. The establishment of the San Gabriel National Recreation Area under HR 4858 would have no effect on state and local jurisdiction of the proposed area. The legislation seeks to ensure that local property rights and land use are respected and not negatively impacted. Creating a new unit of the National Park Service in the San Gabriel Mountains is the next step toward implementation of the findings and recommendations contained within the San Gabriel Watershed and Mountains Special Resource Study. HR 4858 has been referred to the House of Representatives Committee on Natural Resources. No hearing date has been determined for the bill. Staff recommends that the City Council support HR 4858, as the bill is consistent with existing City Council policy relative to preservation and protection of open space. Furthermore, HR 4858 is complementary to the City Council's support of S. 771 (Boxer), the Soledad Canyon Settlement Act, relating to CEMEX's proposed sand and gravel mine in Soledad Canyon.